The Nyrius ARIES Home+ wireless HDMI transmitter promises full HD picture quality, with zero latency: crucial for gaming where speed and timing is important. Does it deliver? Find out, and enter to win your own. 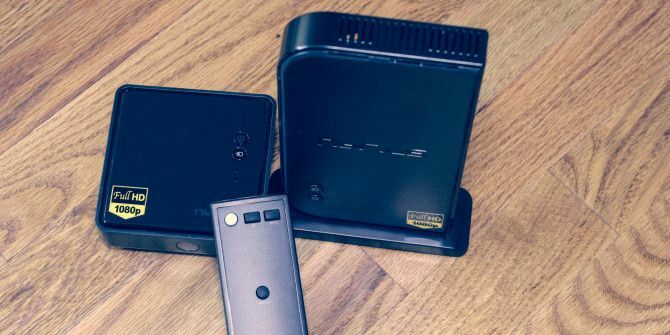 What Is The Nyrius ARIES Home+ Wireless HDMI Transmitter? The purpose of this device is clearly defined: take an HDMI signal from somewhere, and wireless transmit it somewhere else. It sounds easy enough, and for the simple requirement of watching TV and movies, it is. But when you talk about gaming, where latency is an issue, it’s something that becomes a bit more of a technical challenge. The Home+ promises to deliver a lag-free experience, all while beautifully displaying 1080p video without any loss, and high quality sound. Of course, Nyrius isn’t the first company to attack wireless streaming over HDMI, with the Iogear Wireless 5×2 HD Matrix being one of its biggest competitors. Iogear has an advantage in that it supports five devices, where the ARIES Home+ only supports two. There are some other differences, but the Iogear offering also comes with a $285 price tag, while the Nyrius is only $179. So if you don’t need five devices hooked up to it at one time, that’s a pretty serious savings. Another competitor is the Actiontec My Wireless system which retails at a similar price to the Home+, though doesn’t claim to offer the same latency benefits as Nyrius’ model. From a price perspective, the ARIES Home+ certainly has an advantage. But does that lower price win out in terms of design, ease of use, and array of features? Keep reading this review to find out. First impressions definitely stick, and I was immediately happy with what I found from the ARIES Home+. As we’ll get to in a bit, it’s a great looking piece of hardware, and it comes with everything you’ll need to get it running out of the box. You’ll find the transmitter, receiver, an HDMI cable, two power cables, the IR receiver, remote, and screws and anchors to mount the devices. Presumably, the devices you wish to transmit already have HDMI cables, which is why they only include the one to go with the receiver. Moving along to the setup process, most of it couldn’t be easier, but we did run into a little snag. You simply plug the devices you want to send into the transmitter, plug it into power, then plug the receiver into a TVs HDMI port and power. They will communicate with each other automatically, and within a few seconds you’ll see the transmitted device on the display. The only part of the setup that’s a little more difficult is the IR receiver. The main receiver is able to get its IR signals from any remote (as long as the remote is on the right frequency), and the transmitter runs those signals through the included IR remote extender. The back of the IR extenders has stickers, allowing you to attach them to the IR receiver of your devices. This way, if you are watching your cable box from a different room, you can send the signal through the receiver and still change the channel. The IR receivers are wired, which means you need to have another set of wires coming from the transmitter. This leaves you with multiple HDMI cables (as many as three if you’re using pass through), a power cable, and IR cables. There’s a lot of wires to manage, so you’ll need to get creative. For people who are really picky with their wire management, this could be annoying, but the trade off is definitely worth it. Another slight issue is with using a computer as the transmitted device. While IR isn’t a problem, there’s no way to hook a mouse and keyboard up to the receiver, which means your computer needs to be close enough to work with a wireless mouse and keyboard. The ARIES Home+ promises a range of up to 100 feet with clear line of sight, and even without that it had no problem working through the walls and floor of my house, but some wireless keyboard and mice can’t work over that distance. You’ll definitely want to test the range of your mouse and keyboard before you make the purchase. The hardware itself is quite attractive. The receiver is a small black box with just a simple logo on it. The transmitter is a little bigger and comes with a stand that allows it to sit upright. Each also has screws so if you have a wall mounted TV, you can screw the receiver and transmitter to them. This will keep your set up clean and tidy, which is often quite important for anyone who went out of their way to mount a TV. On the back of the transmitter, you’ll find the power port, the IR port, two HDMI in ports, and one HDMI out port for looping through. The receiver simply has the power port and the HDMI out port for hooking it up to the TV that will be taking in the signal. It’s all quite simple and elegant. A small design choice, but one that I always appreciate, is a nice long power cable, and this definitely has that. Because this is a device that could be mounted on a TV, placed somewhere on an entertainment stand, or hidden behind something, having a long enough cable is critical. All in all, this is a well-designed piece of hardware. It looks great, and feels well made and solid. It’s also designed in such a way that if you want to hide it away you can; but if it is visible, it will look nice sitting alongside your video game consoles and cable boxes. The main reason to buy a device like this is because you want to watch media from one device on another. In doing this, the ARIES Home+ delivers. Once you get through the relatively easy setup process, you’ll be able to view up to two devices on the receiving screen with minimal effort. For Internet video, this opens up a huge range of options that wouldn’t be available through a device like, say, an Apple TV; though if your only reason to buy one is to broadcast videos from your PC, a Chromecast (our review Google Chromecast Review and Giveaway Google Chromecast Review and Giveaway We're giving away a Google Chromecast, so read through our review, then join the competition to win! Read More ) may be a better option at just $30. You can also use the Home+ to broadcast the signal from any standard cable TV box, which allows you to watch TV in places where you wouldn’t normally be able to. The passthrough means you can stream the TV signal while still watching it in the main room. Of course, you’ll need to be watching the same thing in both rooms, which limits the use cases, but it’s still a cool feature. Another part of the TV feature is the IR receiver, which we looked at before. Unfortunately, I couldn’t get these to work with my cable box and remote. This could be an issue with my specific model of cable box, but I consulted the owners manual and found the exact location of the IR receiver, and still couldn’t get it to work. Ultimately, this rendered the TV portion of the device useless for me, but your results may be better there. Since HDMI is a digital signal, picture quality is indistinguishable from watching directly on the source; and with support for AC3 and DTS, you won’t sacrifice audio quality. For watching media, this device delivers a solid experience. You can watch TV, watch media from a computer, or even watch stuff from your PlayStation or Xbox. Aside from the IR issues I faced personally, the ARIES Home+ delivers as far as video goes. When I was told this device offered a zero latency experience, I was a little skeptical. I’ve reviewed the NVIDIA Shield and PS4, both of which offer in-home game streaming, and both of which have issues with input lag. The ARIES Home+ actually does in fact offer a completely playable experience, even with games where reflexes are important – something I could never say for other such devices. First, I hooked the receiver to my living room TV and the transmitter to my gaming PC, which is located a floor below. I booted up a fast-paced game called Nighog, and I was immediately shocked that my play wasn’t negatively impacted by streaming the game. Still skeptical, I reversed the set up, hooking the transmitter to my PS4, and the receiver to the TV downstairs. I launched into Injustice Gods Among Us, a fighting game with DC superheroes, and was ready to be let down. Again, it delivered a perfectly playable experience, even in a fighting game where speed and precision is important. If there was any input lag, it wasn’t enough that it gave me any issues at all. At this point, I was sold. I could even play Call of Duty streamed over the network, which seemed like an impossible feat. It really does deliver an experience where the latency is low enough that you can’t tell. The ultimate compliment I can give is that at one point I forget I wasn’t playing in the same room as the console. It just works. I must admit, I was skeptical going into using this device, but it actually manages to deliver on all of its promises. It works even when the receiver and transmitter are on separate floors, and the latency is low enough that you can play twitch reaction video games without issue. Picture and sound quality are great, and the only issue I faced was with the IR, which could be a problem with my cable box and its remote, not the device itself. Did I miss how the controller would worK when playing in a different room?